Lately we can’t get enough of our newest Bancha Hojicha, a nutty, rustic, and roasted Japanese green tea! Served cold over ice, it’s been a hit at Martha Stewart Café in NYC, and also at the Black Rock and Westport farmers’ markets. With summer’s balmy weather, there is nothing like a refreshing cup of iced tea to cool you down and quench your thirst. Here are three easy techniques that show you how to make loose leaf iced tea as an instant cup, a pitcher, or a gallon or more with your favorite Arogya tea. Over the past year, I have fallen in love with distilled white vinegar. My admiration is not due to its taste or somewhat pungent odor, but white vinegar’s incredible versatility as a cleaning agent, drain cleaner, an overly curious cat deterrent, and more. In the heat and humidity of summer, I have found that a simple elixir of vinegar and distilled water is not only an excellent counter and sink cleaner, but also works wonders at keeping mildew at bay. This concoction is better for one’s health than store-bought all-purpose cleaners, even those labeled as “natural” and “non-toxic”. Every summer when I was growing up, I would eagerly await the first bite of my mother’s delicious rhubarb crisp. Within hours of picking the vibrant red stalks from my aunt’s garden, she would transform them into this slightly tart seasonal treat. We’d enjoy it for dessert alongside vanilla ice cream or even by itself as a special breakfast delight. Every week, we’ll be posting a sweet or savory recipe featuring produce from the Westport Farmer’s Market. This week, we’re excited to share a seasonal sauté of bok choy, turnip and dandelion greens, fresh chives with their flowers, and miso. The greens were grown by Sport Hill Farm, one of our favorite small farms located in my hometown of Easton, CT. In addition to being delicious, this dish is loaded with wholesome nutrients. The Westport Farmers’ Market is in Full Bloom! We are happy to announce that the Westport Farmers’ Market is now in full swing every Thursday from 10:00am – 2:00pm until the beginning of November! The Westport Farmers’ Market was founded 10 years ago by an inspiring and philanthropic duo: the late Paul Newman and Chef Michel Nischan. Arogya proudly became a vendor in 2007. On a sizzling day last week, we created this easy and refreshing recipe for dairy-free Thai iced tea. It’s a healthier twist to traditional Thai iced tea, using coconut milk instead of condensed milk and raw honey or organic agave nectar instead of sugar. It’s also chemical free. You might notice the color of our Thai iced tea is not as red or orange as the tea you might order at a restaurant. That’s because the vibrant color we’ve grown familiar is a product of artificial food dye. Before the ramps, or wild leeks, season comes to an end, we wanted to share this tasty pesto recipe. Made from ramps and kale, this easy pesto offers a delicious way to dress up quinoa, whole wheat pasta, brown rice, farro, or even a slice of toast. In addition to having a pleasant yet pungent garlicky flavor, ramps are loaded with vitamins A and C, as well the minerals selenium and chromium. Kale is an exceptional source of vitamins K, A, and C. It’s also rich in organosulfur compounds, which have been linked to cancer prevention. You might want to throw some toasted walnuts into the pesto, reinforcing it with nutritious omega-3 fatty acids. Our living space has a tremendous effect upon our mental and physical health and well-being. When people walk into our storefront in Westport, CT, very often they immediately take a big breath in and say, “Wow! it smells so nice in here.” Or as they walk around the store browsing our teas and wellness products they mention how calming the space is. And when clients come out of an acupuncture or massage session, they often linger in our store front to soak up the good vibes and peacefully drink a cup of tea before moving on with their day. Everyday I see people coming in to our store and immediately being uplifted, soothed and reminded to breathe deeply upon entering our peaceful environment. What makes a space healing for your mind and body? And how can you bring these elements into your own life so that you too can make your home a wellness sanctuary? Something we look forward to every spring is foraging for ramps, a delightful and pleasantly pungent variety of wild allium. 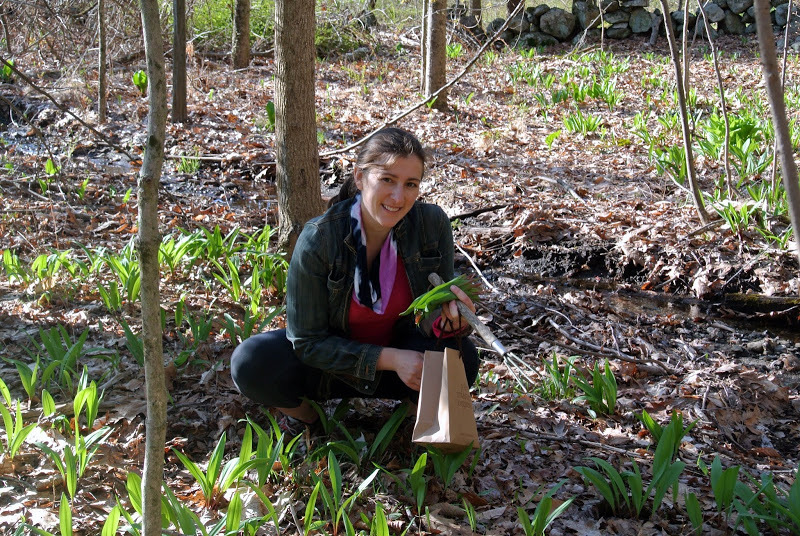 Ramps are actually one of the first edibles of the year, making them a welcomed site after a long winter in the Connecticut. In essence, they are a symbol of rejuvenation and reminder of the warm months ahead.